The best laid plans of mice and men… This week my manly plans had me feeling like a mouse. A mouse that played chicken with the cat…. and lost. This was all thanks to the Cranmore Hill Climb, which served as the U.S. Mountain Running Championships this past Sunday the 26th. It’s not the hill climb part that gets you though. It’s the part of the race they DON’T mention in the title – the Hill De-climb. What goes up, must come down and usually at a much, much, much faster speed. The three loops of the race, each with their free-fall speed descents tore my quads to shreds. I did my usual ten miles post race and felt fine on Monday. But as is typical with races including long, steep downhills, on Tuesday (2 days post race), I had a hard time walking. For some reason, the real trauma to the legs does not show up right away. Even though I picked up my mileage again on Wednesday, I felt flat throughout the week. The inclusion of upright rowing machine into my routine again may have played a part in that as well, as it really taxes my quads and puffs them up like biking. 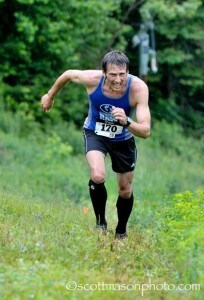 I didn’t expect much going into the Loon Mountain Race, but I’ve felt flat before and performed really well. There were a lot of good guys in the race and I decided to let the rabbits go in the beginning and see how my legs felt. The climbs at Loon seem endless and if you go too hard in the beginning, you’ll be absolutely laid to waste when you hit the final climb up the double black diamond “Upper Walking Boss” ski trail. This section is half a mile long and climbs over 800 feet. The average grade is 35% with long sections at a 45% slope. This final climb breaks the best mountain runners out there. Although I felt good for the first 2 miles of climbing, by mile 3 my legs were done. I considered dropping out of the race as my pace slowed considerably and my competition quickly pulled away. I knew I still had the worst part of the race ahead of me and if I was toast here, it would only get worse. But then a friendly female voice called out from behind “keep it up Tim! Stay with me!”. I turned to see the blond curls of 2011 runaway U.S. Mountain Champion Kasie Enman en route to shatter the Loon women’s course record. Digging deep, I matched her short, quick strides. But that did not last. She gapped me by 10 seconds at the first summit at 4 miles. I was determined to catch her on the long steep downhill section that brought us to the base of North Peak. My legs were pounded so hard by the descent that my kidneys and other organs started to hurt. 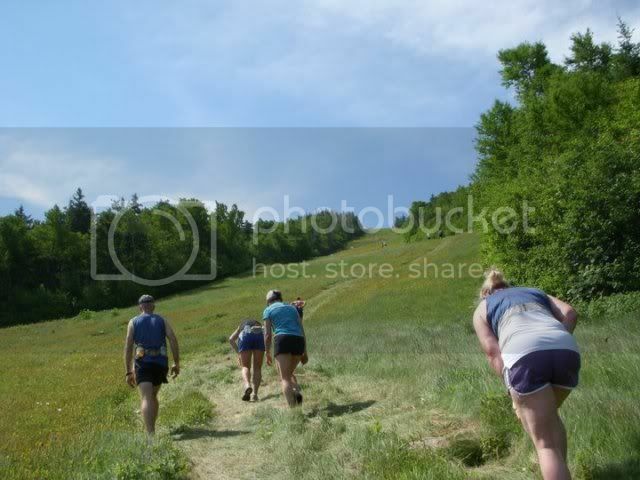 When I finally caught her at the base of Upper Walking Boss I was ready to vomit… and the toughest, steepest hill climb in the Northeast was now staring me straight in the face. I looked up and saw Brandon Newbould leading Jim Johnson only 150 meters ahead of us, and Ross Krause and Todd Callaghan (who I’d been running with for the first few miles), now about 100 meters ahead. This isn’t a lot of distance, but on a hill this steep it can take several minutes to cover that ground. Kacie’s short, piston-like steps were impressive, she churned up the hill faster than any of the lead guys in front of her, as the gap became progressively smaller as we climbed. I held on for dear life. The sight of the leaders walking and laboring against the climb gave me hope. I found another gear and pushed into the pain trying desperately to stay with Kasie. The positions in front of us changed as Jim Johnson succumbed to the hill and Ross Krause made a surge to nip on Brandon Newbould’s heels. It took well over 10 minutes to climb that half mile straight up. Kasie was still running strong and seemed unphased. We hit the summit at 5 miles and she was 15 seconds up on me. She uncorked her Olympic Trials marathon speed and accelerated across the top. I couldn’t keep up. My legs were rubber bands. To add insult to injury, we now had to drop 500 feet on a very steep 30% slope for 3 tenths of a mile and then run up a 100 vertical foot hill at a 30% grade to the finish. The climb took the strength needed to break on the downhill out of my legs, so I ran with unintentional reckless abandon. At one point, I caught air off of a water bar and came down completely out of control well in excess of 20 mph. I waiting for the rocks and hard ground to abruptly meet with my face and shoulders. But somehow it did not happen. The flow kept me upright and moving forward. I was gaining on Kasie, but really had no control of my running at this point. I was simply on a ride that I couldn’t get off. Moments later we were making the final climb, which would stand out as impossibly steep and difficult in ANY other race, but after what we had just been through, it did not even register. Kasie finished 10 seconds ahead of me and set a new women’s standard on the course that may never be beaten – unless she comes back to beat it next year. I didn’t even bother to look at my time when I crossed the line. In my mind, I had a terrible race. I had been defeated. It wasn’t until several hours later at the awards ceremony that I realized that I had beaten my best time at Loon and set a new personal record. It just goes to show you that sometimes in life when we think things are going to hell and we want to quit, if we just keep going, we might actually discover that things were always far better than we had imagined them to be. Next week: Back off the mileage a bit. Increase upright rower training. Start Tabata leg press regimen again. REST – Beat up from Cranmore! This entry was posted in Diet Tips, Plant Powered Athletes, Race Reports, Racing, Running Tips, The Journey, Training and tagged Hill Running, Jim Johnson, Kasie Enman, Loon, Loon Mountain, Mountain Running, New Hampshire, Race, Running, Tabata, Trail Running, Training, Uphill, Upright Rower, Vertical. Bookmark the permalink. My wife and I ran Loon 2 years ago not really knowing what to expect, just knowing it is HARD. Couldn’t believe how steep Upper Walking Boss when we started the climb. Wendy wanted to stop and quit, but if we didn’t keep going I was afraid we would roll back down the hill. We finished dead last, but Paul was there waiting for us! Got to try this again! !